We came to know so many talented bloggers and read so many great posts. 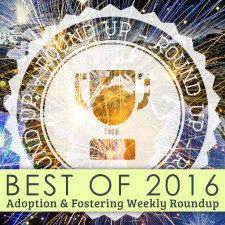 We are glad to see many of you taking part of this special edition of the Adoption and Fostering Roundup. We hope to see all of you featuring on the roundup page again this year, as well as welcoming new faces we haven’t read about yet. As this is a special edition of the roundup, we decided to include an article from each blogger who was nominated. They all wholly deserve it. Has anyone seen my stork? A blog about infertility. : And they lived happily ever after. Or did they?